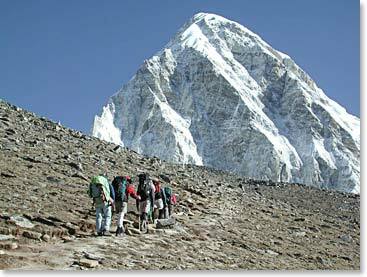 The rarely climbed peak Pumori, 7161m/23,494ft, sits across the Khumbu Valley from the highest peak in the world, Mt. Everest. Pumori was referred to as “Unmarried Daughter” by George Mallory, and “Everest’s Daughter” by the local Sherpas. Pumori is considered a serious technical climb. With its steep rock and mixed-ice sections, avalanche and rock fall hazards, and high elevation, it welcomes a few elite climbers per year. In many climbing seasons there are no successful ascents. Jamie Clarke from Calgary, Alberta, will attempt to climb the impressive southwest ridge. Jamie and his team, his good friend and climbing partner Todd Craig from British Columbia, Canada, climbing cameraman Scott Simper from Salt Lake, Utah, and climbing athlete Sara Lingafelter from Seattle, Washington, along with BAI’s outstanding crew of climbing Sherpas are in for a big challenge over the next couple of months. Stay tuned and follow our expedition as we make our way from Kathmandu, through the Khumbu Valley to establish our base camp and reach for the top of Pumori as a team! October 29, 2009 – The Intense Program of Last Minute Shopping in Kathmandu! October 12, 2009 – Pizzas, Cokes and Lots of Shopping on Our Rest Day! October 10, 2009 – We Made It to Lukla!